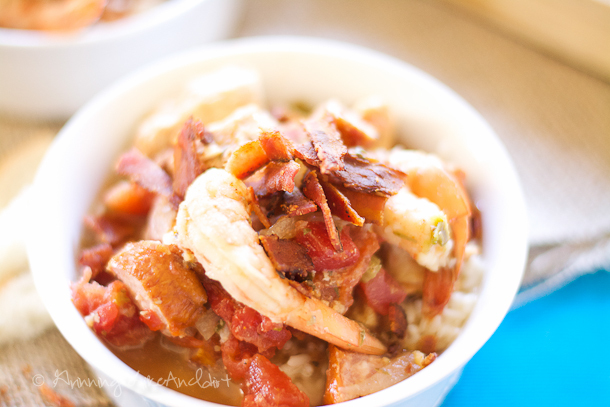 Jambalaya is a dish best served spicy and warm over a bed of rice - did I mention spicy? 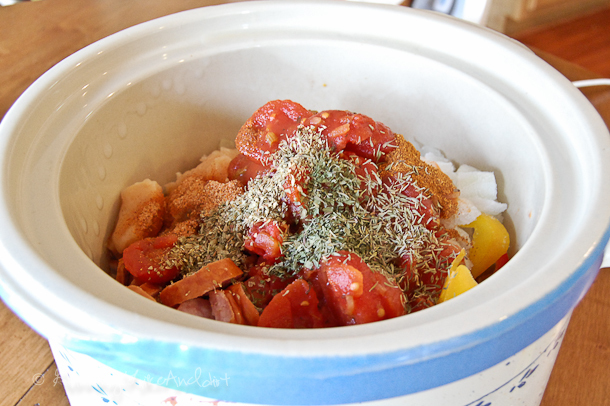 Ben and I LOVE spicy foods, but our kids like not-so-spicy foods so we often keep Tony Chachere's Original Creole Seasoning close by so we can add it to our food. Ben even puts it on his eggs! But every now and then I break away from the dishes that are made with aromatic, flavorful spices and break out the Creole and Cayenne Pepper just for Ben and I. (We give a little to the kids, but load them up with more rice than Jambalaya). I hope you try this recipe that have honed over the years to kick it up a notch: make it and freeze some to enjoy later. 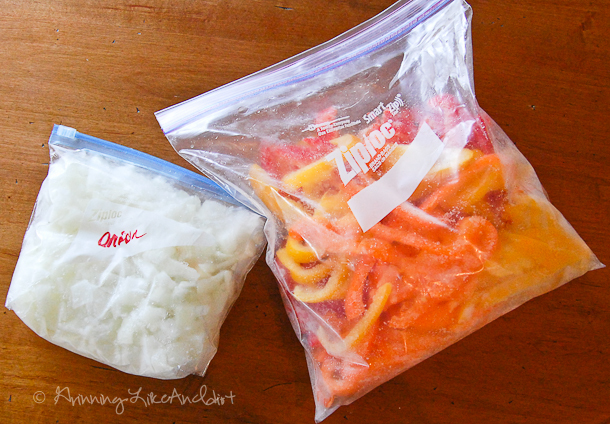 When I buy onions and peppers, I buy a bunch at Costco and take the time that day to slice and chop then freeze. It saves me a lot of time throughout the week. You can do the same with the chicken and sausage, cut a lot in cubes and freeze. 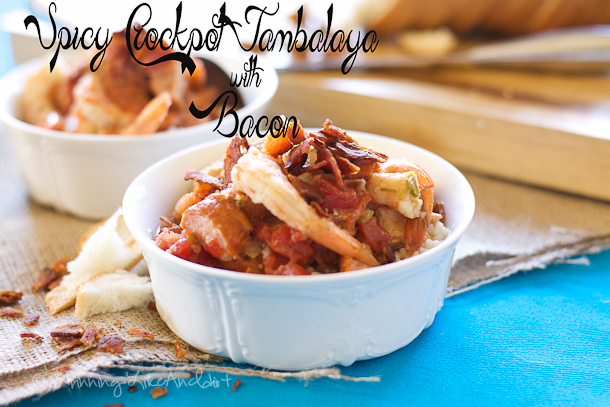 So next time you want to make Jambalaya it'll take half the prep time! I added everything Except for the shrimp and bacon. The frozen shrimp is added in the last 30 minutes. I used one piece of crisp bacon per serving as a garnish. For another personal family favorite crockpot recipe, be sure to check out my Hearty Crockpot Chili. I've modified a base Jambalaya over the years to remove what I don't like and add more of what I do - the result a spicy, meaty, rich dish. 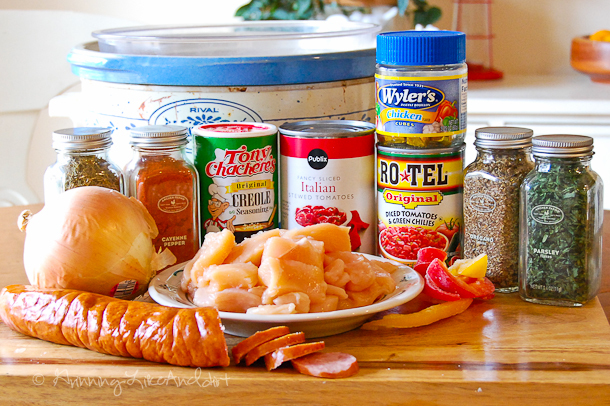 Add all the ingredients in the crockpot EXCEPT the shrimp and bacon. Cover and cook 7 to 8 hours on low or 3 to 4 hours on high. Stir in the frozen shrimp the last 30 minutes of cook time. Serve over rice and Garnish with crisp bacon if desired.